Many individuals deal with computer systems on a daily basis for work. Nowadays, excessive time is being spent sedentary. This information describes straightforward, concepts related to ergonomics that can assist you in developing a more comfortable and effective posture when working or at leisure. These ergonomic tips are general and a visual way to get an idea of a “ideal sitting posture”, however, we will get more specific with some additional tips for how to improve posture and reduce pain. 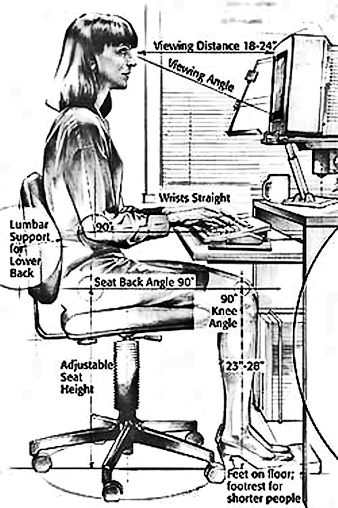 Even with proper seated posture when using a computer as described above, remaining still and sitting for extended periods will be harmful to muscles, joints, ligaments, tendons and discs of the spinal column. Change your work position as often as possible during the work day by: A) performing fine ergonomic adjustments to your seat and/or seat back, B) stretching muscles in your neck, arms, hands and back and C) getting up to walk about for a brief period throughout the day. When working at a computer, you should take these 3 factors into consideration, and this should also be considered when at leisure as well. It is not always possible to get up and move around as much as we would like. 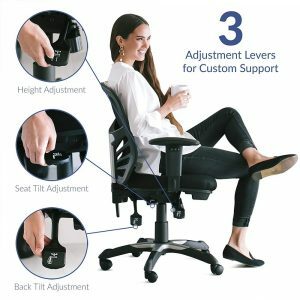 In order to assist the body with maintaining a level of activity, Active Seat has come up with an nice solution to help increase the level of activity while you sit. 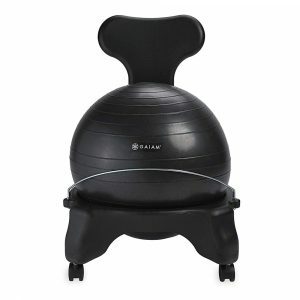 It can actively engage the spinal muscles while you concentrate on work. This has effects on the joints, ligaments, discs and blood flow, including flow of disc nutrients. 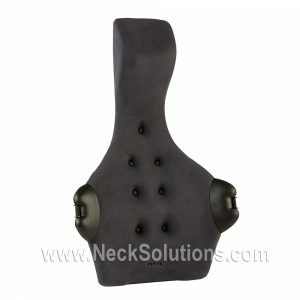 It can be used in ergonomics to better align the back as well as feet. The main idea is to avoid the effects of no motion or prolonged inactivity. Ergonomics tells us to have proper alignment, reducing the effects of gravity and minimizing strain on the musculoskeletal and cardiovascular systems. 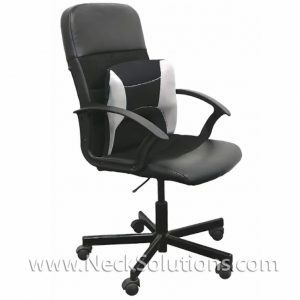 Therefore, activity is good to incorporate into your ergonomic environment. 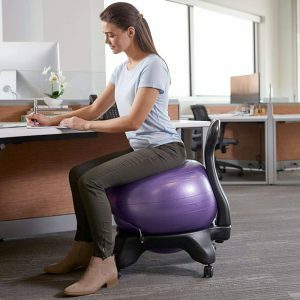 A 2016 study in the American Journal of Physiology-Heart and Circulatory Physiology shows that “fidgeting” (small amounts of leg movement) can prevent prolonged sitting induced leg endothelial dysfunction. This condition dysfunction of the arteries and may result in developing artherosclerosis, which is a chronic disease with hardening and thickening the arterial walls. 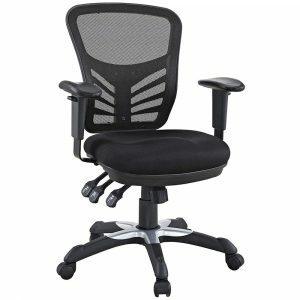 A later study in the 2017 Clinical Science journal concluded, “…standing represents an effective substitute to sitting for preserving leg conduit artery endothelial function.” So, we have advice on standing ergonomics for avoiding pain with prolonged standing, however, we concentrate mainly on sitting due to the increasing sedentary nature of work. 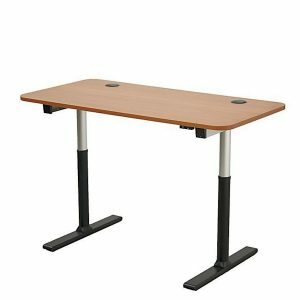 It is optimal to vary between sitting and standing while working. 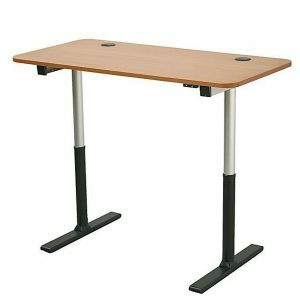 With the advent of standing desks, this has been made both affordable and easy to implement, providing an optimal solution. 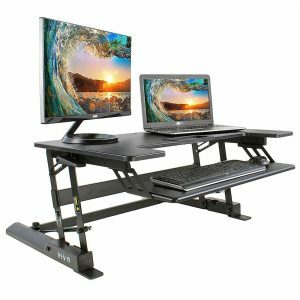 We know sit/stand workstations can vary gross posture. A 2019 study in Applied Ergonomics found positive effects for neck, upper body and arm posture. The authors documented a increase in up to three times the variation in posture of the neck, arms and upper body when 20% to 60% of work was performed standing as opposed to sitting 100% of the time. 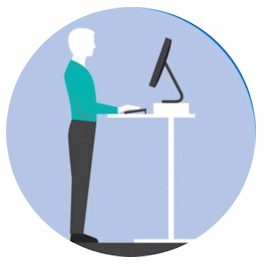 While standing desks provide a great way to remain active, you still need to observe proper ergonomics. So this takes some basic knowledge and a commitment to make a positive change. There are simple ways you can stretch even while remaining working at the computer. 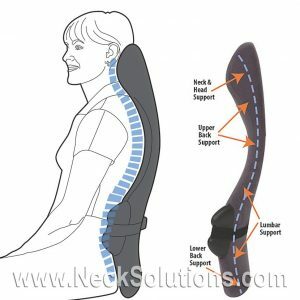 Simple exercises for the neck can be done while sitting and working, a spine lengthening stretch can be done while sitting at the computer and will help train correct body posture. 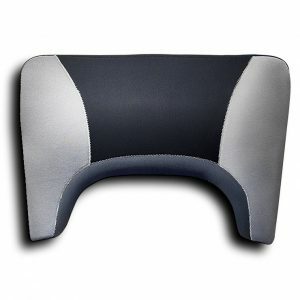 Back support cushions are readily available and can be an inexpensive alternative to purchasing a new ergonomic chair. 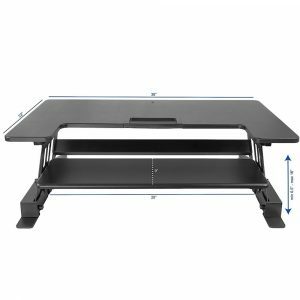 A 2018 study in the International Journal of Environmental Research and Public Health examined the effects of a standing desk in children’s classrooms on musculoskeletal discomfort and standing and sitting time at school. 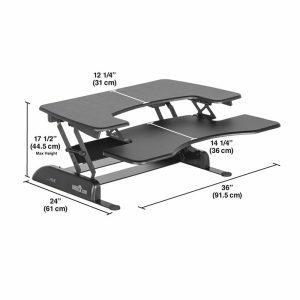 Installing sit/stand desks in classrooms shows potential health benefits. Encouraging habits of less sitting with children may possibly be carried into adulthood. To help reduce strain on the neck and shoulders, keep the top of a monitor level with your eyes. Keeping the keyboard, along with document holders straight in line with your body can help avoid any unnecessary twisting and turning repeatedly to one side. Maintaining this balance can help avoid neck and shoulder pain associated with computer use, especially women, called trapezius myalgia. Two, or perhaps three short breaks an hour can actually improve productivity as well as reduce risk of injury. So, don’t feel bad about getting up and away from the computer for brief periods throughout the day. When taking breaks, it is good to get up and move around. Walk a bit and perhaps do a little stretching. This movement prevents chronic shortening of muscles as well as helps to lubricate your joints and take pressure off the spine. While using these tips can help with both neck and back pain when sitting, taking breaks is a good idea. It may sound a little crazy; getting everything set up to sit properly, then saying, “take a break and get up”. But, it is important not to sit too long regardless of posture. A good idea is to get up and walk around a bit. In fact, a 2014 study in the European Spine Journal found that those with jobs requiring staying still for extended periods could protect themselves from neck pain by increasing the number of walking steps per day. Using a pedometer, they were able to determine that increasing daily walking steps by 1,000 led to a 14% reduction for getting neck pain. When sitting, good posture is important, however, don’t get overly occupied with sitting straight up. It is good to recline for a while and shifting your posture often alleviate strain, fatigue of the muscles of the shoulders and help neck and back pain symptoms. Positioning the keyboard at elbow height, or somewhat below elbow height will allow the neck and shoulder muscles to relax when typing. A big problem working with computers is not just neck and back pain. In fact, a major complaint with sitting at a computer for hours is eye strain. Computer vision syndrome is a term often used to describe a condition resulting from extended periods of computer use involving eye strain, sensitivity to light, headaches, back and neck pain. Regularly look away from the monitor – an eye break. Look away from the monitor for about 30 seconds, preferably into the distance rather than close up. Do this 2 or 3 times and hour, perhaps when shifting postures. Try to keep your monitor positioned approximately your arm length from your head to help reduce eye strain. Keep the monitor perpendicular to the desk, keeping away from sources of direct light that can produce glare. Keep your monitor free of dust and adjust the settings properly. Some individuals call them wrist rests, however, they are really palm supports and should only be used when taking a break from typing to rest the hands. Using these to rest with your wrists, or worse, when typing using a palm support under the wrists can actually increase pain & symptoms in the wrists and hands, increasing the risk for related injuries and conditions. To help alleviate wrist & hand problems when typing, have the keyboard below or at elbow height and level or angled slightly away from you, with the back portion angled down. If this is not possible, you can have the keyboard supported on your lap. Does This Ergonomics Stuff Really Help? A 2014 study in the International Journal of Occupational Safety & Ergonomics gave specific exercises/stretches during breaks for computer workers with neck and shoulder pain. They discovered that it did not matter which type of rest activity was performed, they all provided relief from muscle pain in the neck and shoulders. They further indicated that no loss of worker productivity was seen with providing breaks. They used 3 minute breaks for every 20 minutes of work. A 2014 paper in journal Work, an article studied the effects of applying ergonomics at work. They noted that work related musculoskeletal disorders are a significant source of pain as well as disability, especially in the healthcare sector. The results from the study lead the authors to conclude that workplace design changes, re-arranging equipment, proper posture awareness, and better work practices are important to reduce musculoskeletal problems. A 2015 study in the International Archives of Occupational & Environmental Health measure sitting time at work and the relationship to neck and shoulder pain. They indicated sitting for extended periods at work is a risk factor for neck and shoulder pain, measuring a direct relationship between pain and time spent sitting while working. A 2014 study in the journal Acta Informatica Medica found a simple internet based learning program using PowerPoint was effective and had a “significant impact” on reforming posture of personal computer users. 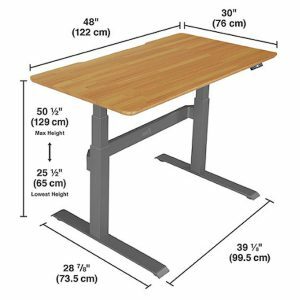 A 2018 study in the British Medical Journal found that a program to reduce sitting time at work, including a height adjustable workstation, was successful at reducing sitting time over short and long term. Positive changes were noted in both in psychological and work related health. A 2018 study in the Journal of Education & Health Promotion found an educational intervention on practicing correct body posture decreased musculoskeletal disorders of the neck, lower back, elbow, and knee among computer users. The evidence is clear, making changes can help and you do not need expensive training classes. The information on this page is free and can help. Try implementing some of these tips, making some changes are better than none. Are Specific Muscles Related To Neck & Shoulder Pain? Studies indicate about 50% of office workers experience neck and shoulder pain on a weekly basis. The effects of sitting for long periods and computer work lead to muscle motor unit over activity, which reduces blood flow and affects muscle metabolism. 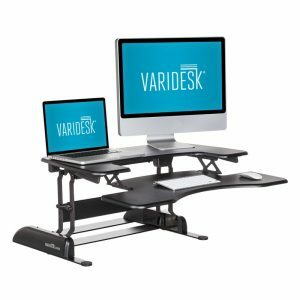 So, experiencing neck and shoulder pain after computer work is a major problem. Besides the deep muscles in front of the neck, which we address in detail with the neck exercises, the muscle most affected is the trapezius muscle. Neck and shoulder pain from myalgia (muscle soreness) points to specific muscles like the neck extensor muscles, the infraspinatus should muscle, the levator scapula that connects the shoulder blade to the neck, and the trapezius muscle, which is the large muscle connecting the neck, shoulders and upper back. A 2006 study in The European Journal of Applied Physiology examined older women computer users and found most with neck and shoulder pain suffered from tenderness of the trapezius muscle (about 40%), followed by neck tension syndrome (about 20%) and cervicalgia, which means neck pain, (about 20%). A 2014 study in Pain Research & Treatment found a strong relationship between tenderness of the trapezius muscle and neck and shoulder pain in office workers. So, focusing on head posture via the deep neck flexor muscles and the trapezius muscle is important. Therefore, practice the first part of the neck exercises to retract the head and use the nodding motion, and this can be done while sitting. Then, get up about every 20 minutes, walk around a bit, stretch, and maybe do some shoulder shrugs. This is done using weights with the trapezius myalgia exercises, however; you can just stand, relax the shoulders down, then shrug and hold for a second or two. Do 15 or 20 of these, or until you feel it in the shoulders. Exercise and have quick effects, however, we do have products that can help you have immediate effects of posture modification. The point is to get moving. It does matter how you move, but there are many methods to achieve this; from simple to more involved, using weights, no weights, bands or assisting devices. A 2017 study in the International Archives of Occupational and Environmental Health indicated that women with computer related chronic neck pain showed reduced pain an increased cervical mobility from four and six weeks to 3 month follow-up. Training was done using progressive resistance with a simple elastic band. The authors concluded that the resistance training was effective for relieving pain, increasing pain threshold, increasing muscle strength, and range of motion. I know from my studies in martial arts, the shoulders must be relaxed and down to generate power. Stress and computer work not only makes our heads go forward, weakening the deep flexor muscles, but also tends to make our shoulders tense up. This tension in the trapezius muscle, along with forward head posture can lead to chronic neck problems. Hopefully, these ergonomics tips can help you reduce pain, improve posture and be more happy and productive at work and at home. Tips for how to improve posture sitting at computer photo from Integrated Safety Management, Berkeley Lab.